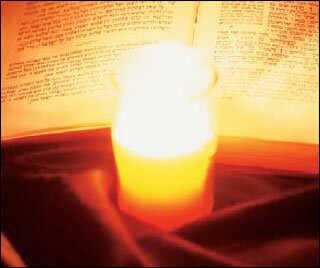 Yizkor , a special memorial prayer for the departed, is recited in the synagogue four times a year, following the Torah reading on the last day of Passover, on the second day of Shavuot, on Shemini Atzeret and on Yom Kippur. In addition to reciting Yizkor for one's parents, one may recite Yizkor for any Jew who has passed on, including relatives and friends. When reciting Yizkor for more than one person, repeat the Yizkor paragraph each time, and substitute the words " Aböh Mori " (my father), or " Imi Morösi " (my mother), with the appropriate title, as follows: For a Husband: " Ba-ali ." Son: " B'ni ." Brother: " Öchi ." Uncle: " Dodi ." Grandfather: " Z'kainy " . Wife: " Ishti ." Daughter: " Biti ." Sister: " Achosi ." Aunt: " Dodosi ." Grandmother: " Z'ken-ti ."